Help martins find the perfect housing in your yard with the Heath 12-Room Deluxe Purple Martin House with Book and Decoys. This wonderful package easily brings birding excitement right to you, while helping purple martins thrive. Once the included Heath Aluminum 12-Room Deluxe Martin House is assembled, run your existing, 1.25" outer diameter pole (not included) through it for stability and easy mounting. Adding the two included Heath Deluxe Purple Martin Decoys to the railings will help attract martins, so they can create their colony. This package makes a fantastic gift for your favorite martin enthusiast, or for anyone interested in bird houses. 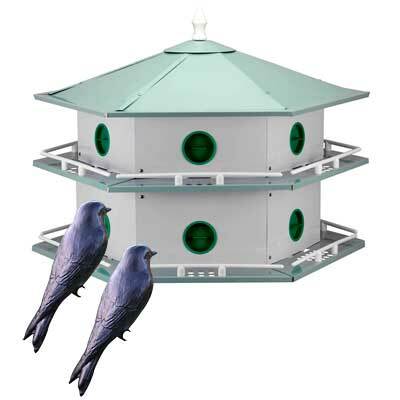 Add a martin colony to your backyard with this Heath 12-Room Deluxe Purple Martin House with Decoys.